I had the opportunity recently to take a trip through the Texas Hill Country and photograph the fall colors. My folks agreed to watch the kiddos, so my wife and I packed our bags and headed out the door. We had a few interesting experiences, but I’ll get to that in a bit. My plans were a bit unresolved until the morning we decided to depart. We had reservations at a bed and breakfast near Vanderpool but the weather appeared a bit iffy, but we finally headed out. However, just before that we got a call from our said bed and breakfast indicating they had double-booked us, and because we had booked after the other folks, we were to be bumped. They offered another option – 30 minutes further from our desired location, no breakfast, and more expensive. Say what? So I kindly said no thanks after expressing my displeasure at this turn of events, and I hopped online, figuring it would be easy to find another option. Did you know the Hill Country is full of tourists in November? I did not. But after surfing through some options, we settled on a little cabin near Leakey, Texas – close to two of our destinations. So we headed out – finally. First stop – Lost Maples State Park. A few days in Lost Maples – on a weekday – can be a wonderful thing. On the weekend when cars line up for hours to enter – not so much. Luckily, we hit the park during the week and enjoyed the solitude such beauty warrants. The maples were turning red, the winds were nonexistent, and the crowds were thin. My wife patiently allowed me to practice my art. Lost Maples is a lovely place. Spending time there with someone you love on a crisp fall afternoon makes for good memories and good conversation. 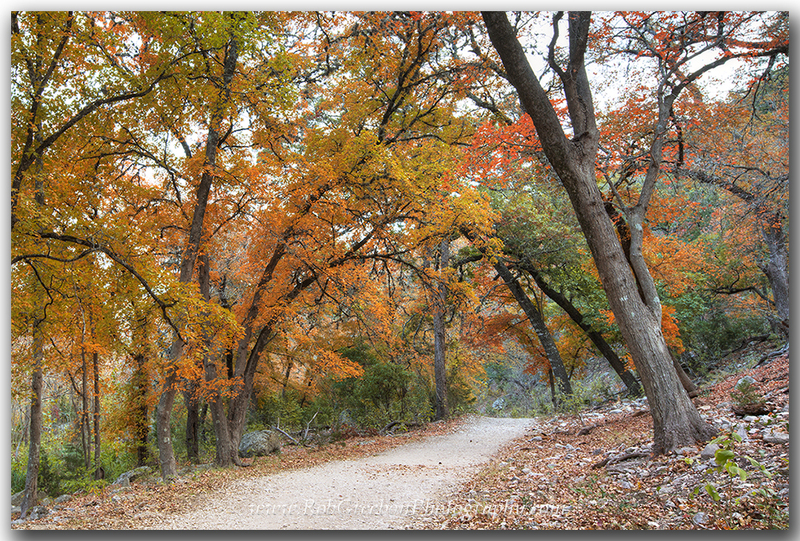 The path of color from Lost Maples can rejuvenate the soul on a crisp Autumn afternoon in the Hill Country. For lodging during our visit to Lost Maples, we had booked a cabin. It was cold – really cold – when we arrived that first night, picked up the key at the dropbox, and unloaded our belongings. The nice lady I had spoken to earlier said the room might be a bit cold, but the heater should warm it up quickly. So the first thing I did was turn on the heat. On high. For 15 minutes. But no heat came out. We called. She apologized and moved us to another room. No problem. These things happen. The next room did have heat. Time to shower… But no hot water. Uggh. OK… we survived, but the shower was brutal. The temperature of the water finally reached lukewarm. After a few days at Lost Maples, we headed south for a bit and arrived in Garner State Park. 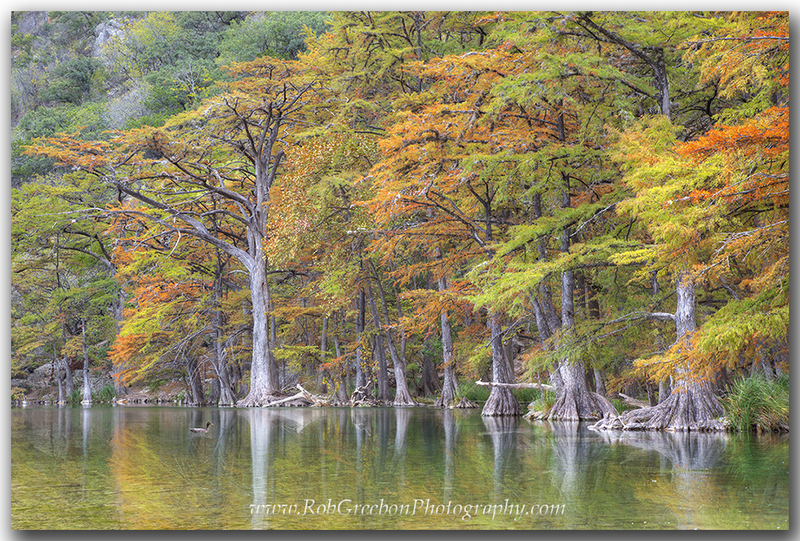 We spent a little time in this area along the Frio River photographing the colorful cypress. I even had a duck swim into my photograph. I thanked him, he quacked, and then swam off. The colors of the cypress trees in Autumn fill this photograph from Garner State Park in the Texas Hill Country. From Garner State Park the last morning of our trip, I wanted to swing through Boerne and visit the Cibolo Nature Preserve. 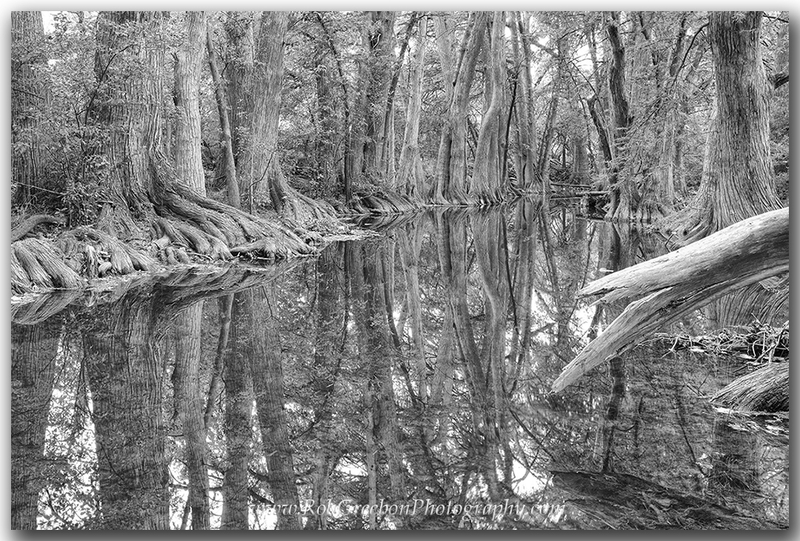 I had not been here before but had seen some stunning photographs of the cypress along Cibolo Creek. As we approached the Preserve, I was creeping along at 30mph, not sure of where I was to turn, when quick as the wind a deer committed suicide on the front of my car. The whole scene was surreal. I was going so slow. How could such a dumb creature cause this much damage at only 30mph? As I write, my SUV is scheduled to go to the car doctor tomorrow for a front end makeover. I never even had time to hit the brakes. With heavy hearts, we continued on (never saw the deer, so I assume he stumbled off and died somewhere). We spent some time walking along Cibolo Creek while I tried to be inspired by the stately cypress along the riverbank, but with the recent deer-into-the-headlights incident, I just wasn’t feeling it. Hopefully some of the images I captured from this trip will help recoup some of the $$$ lost. This black and white image from the Cibolo Nature Preserve comes from Boerne, Texas, a little town with a lot of charm. In the meantime, please feel free to visit my photography website. The colors are beautiful out there right now. I hope you have a chance to get out an enjoy them!